It may be cute when a small puppy excitedly jumps at you when you come home, but when that same puppy hits 20, 30 or even 90 pounds, the behavior can be more than bothersome. Before you realize what a problem it is, you may have already encouraged the behavior. Fortunately, there are specific steps you can take to train your dog to not jump on you or guests in your home. WebMD recommends methods that involve positive reinforcement, but never punishing the dog. Sarah Hodgson, dog and puppy behavior expert and author of Puppies for Dummies, says that pushing your puppy away when it jumps signals to the pup that it is time for confrontational play. Fortunately, there are techniques that work well in training a dog to not jump. Stand in front of the dog and wait for him to give you his attention. See if he will sit on his own. When he sits, give him a treat and praise him. After doing this several times, add the command "sit." The ASPCA pet behavior experts say that if the dog is overly excited and jumping, ignore it until the dog calms. Go about daily tasks and do not speak to or look at your dog as long as he is excited. If the jumping is out of control or the dog is yapping, leave him in a crate and give him some time to calm down. Once the dog is released from his crate, do not acknowledge him until both of her front paws are on the floor. Cross her arms over her chest with her hands placed on her shoulders. Look up as though seeing if rain is coming and refuse to make eye contact with the dog. Remain in this position until the dog has both front paws placed on the floor. 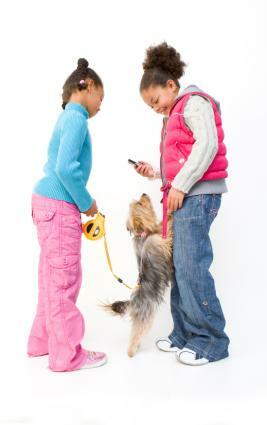 Pet the dog quietly to reward the good behavior without causing more excited jumping. Sarah Hodgson suggests creating a barrier between you and your dog's body. 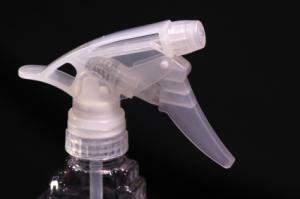 Fill an empty mister bottle with one part water to one part vinegar. Spray a boundary between you and the dog to slow him down. Do not spray the solution in the dog's face or on the dog. Once you've sprayed the boundary, walk away and refuse to make eye contact with your dog until he stops jumping. Ignoring bad behavior is only part of the equation. 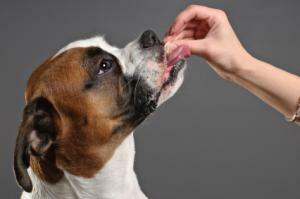 Nearly every dog expert, including Millan, Hodgson and the ASPCA experts, suggest praising your dog when he does as you wish. 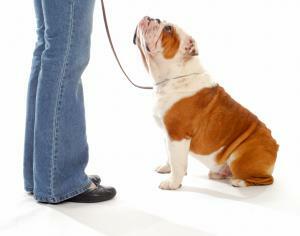 Extreme punishment may be one of the biggest factors that creates a dog that is wary of people. It can cause a dog to react with aggressive behavior and develop other problem behaviors beyond the one you are trying to correct. 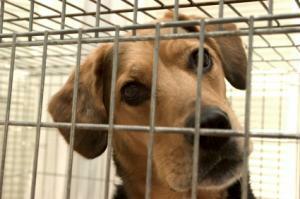 On top of all that, you may be breaking animal cruelty laws in your area. Puppies are typically more excitable than mature, adult dogs. However, different breeds and temperaments can take more time to train and to calm down. It is important to train your dog from the time he is a puppy or comes into your home, but understand that the sheer joyful jumping of some dogs is simply part of their personality. This may help you maintain patience as the dog learns what is expected of it and the rules of your household. Over time, you should have a dog that is virtually free of jumping and an excellent companion.